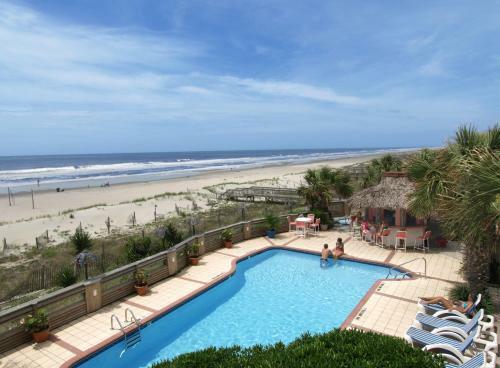 The Winds Resort Beach Club is an oceanfront resort located on the shores of Ocean Isle Beach. Guests will enjoy a daily hot breakfast buffet and 3 separate pools at this resort. Free WiFi is offered to all guests. Framed by palm trees and sand dunes, The Winds, on Ocean Isle Beach, NC, is a sanctuary to escape from the real world as if time has stood still. From a six bedroom cottage to your own beach side, single guest room, these Ocean Isle accommodations offer a range of choices. Three pools (one indoor), a complimentary hot Southern breakfast buffet, free WiFi, bikes to explore the island and much more. Oceanfront hotel rooms and 1, 2 & 3 bedroom suites (with kitchens) overlook palms, banana trees, hibiscus flowers and our breathtaking island beach. The Winds also offers 4, 5 and 6 bedroom Resort Cottages (with full kitchens and large livingrooms) to easily accommodate a large family or group. No matter what your needs – we’ve got it covered.